Malsoc Newcastle University | All you need to know about NU Malaysian Society. All you need to know about NU Malaysian Society. Now that exams are over, we can focus on more exciting things this semester! in the mean time, pop along to one of our weekly sports event. With the recent events of uprising that is occuring around the world, demonstration and freedom of speech has always been a pivotal issue and Malaysia is not left out. In regards of this current events, for the first time, MALSOC together with Kelab Umno Newcastle Sunderland (KUNS) are organizing our very first National Forum with the title ” Demonstration in Democracy”. Interested in having an intellectual debate discussion and have your views and opinions to be conveyed out? Well, here’s your chance! Food?? : Lunch for FREE!! There are tonnes of activities lining up for the night so come along, feast and enjoy. Featuring Malaysian cuisine such as: Nasi Empit, Ayam Rendang, Madras Curry, Bihun Goreng (Fried Rice Vermicelli), Satay Sauce etc. If you are a Culinary Master and love to share your passion to all of us, we welcome you to bring your own home cook dishes but please be remember that it has to be halal and beef free. (Please spare at least 3 quid for your food) 😉 To reward your great effort we would of course invite you in for FOC. So come along and meet your fellow Malaysian. Please bring along your Student Card for verification. Thank you very much. Hope to see everyone on the 5th of November. Holla! To all those freshers arriving early on for the new term. Some tidbits would be provided. Definitely a must attend to meet more international friends. Congratulations once again to those who got into Newcastle and let Malsoc extend our warmest welcome. 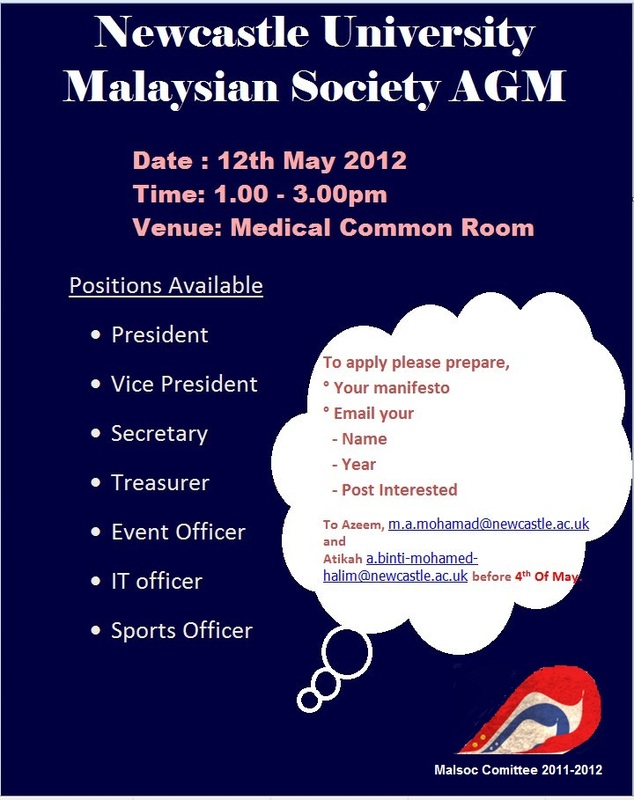 we will be at the University Sports Centre from 10am- 4pm so please drop by to be part of MALSOC Family. Wishing all fellow Malaysians a safe trip back and a wonderful year ahead. Next session, small tables/booths for universities for Q & A session with future students and parents. Dialogue and introduction of MALSOC to students. Wristband give aways, slide show of pictures of our previous events. UKEC magazine and pamphlet on life in newcastle and all the informations that is required in prior coming abroad. where activities will be made known to anyone who is interested, just so you know you don’t exactly need to be a member to be a part of us.